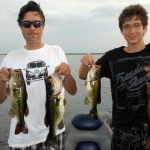 Just 4 bass working for Fast Break Bait and Tackle. This is day 2 with Mauricio & Pedro Coutinho from Sao Paulo, Brazil. We fished with artificials all day. Here is a picture of some of the fish they caught.